I have mentioned in previous posts that I am getting more into my skincare now, I am investing more into better skincare, and trying to find products which are more targeted towards my skin concerns. Because we all know good makeup days start from good skin. My skin is not too badly behaved, but once that time of the month comes it plays complete havoc on my face. I have quite combination skin and oily t-zone for reference - I have decided to split this post into two half's, a morning routine and a night time one to follow. 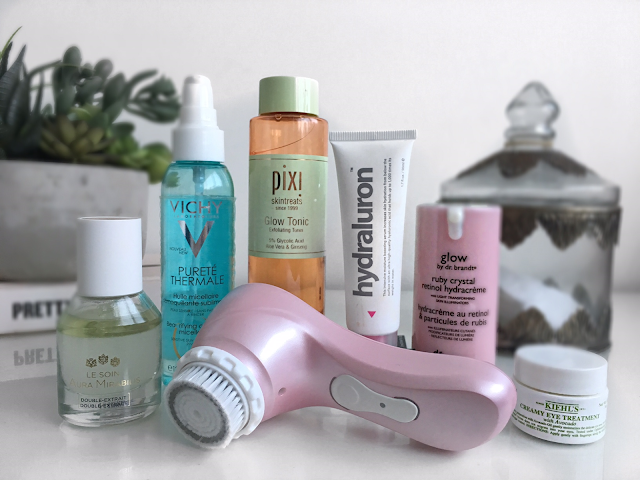 The products I have here are what have really been working for me at helping with breakouts, while giving my skin a deep clean and a smooth base, ready for my makeup in the morning. I start my morning routine with a cleanser which hydrates and cleans my skin, such as the Vichy Purete Thermale Cleansing Micellar Oil. I was recommended this by the lovely people at Escentual and I absoloutely love it. All I do it pump out a bit and massage onto dry skin, it's like a micellar water, but an oil version which is way more hydrating and better at removing makeup in my opinion (I also use this as my 1st step night time cleanse). Another cleanser I have been using and really enjoying is the Mario Badescu Enzyme Cleansing gel, I have had a few samples of this and it's great for a morning cleanse when you are having those pesky breakouts as it contains AHA's, which exfoliate dead skin cells revealing brighter skin. 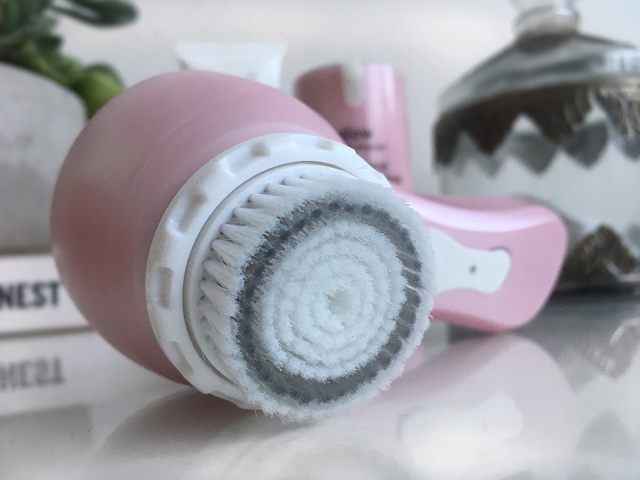 My cleansing routine wouldn't be complete without a cleansing brush (day and night). The Magnitone Bare Faced facial brush is excellent at exfoliating, it really deep cleans your pores which helps at keeping your skin clear, while preventing future breakouts. My makeup base applies flawlessly, after using this and my skin looks way more radiant pretty much instantly. I have been using Magnitone for nearly 2 years and I honestly couldn't live without it now, it's a staple in my skincare routine. I like to use this brush in the morning with my Mario Badescu Cleanser as it makes more of a foam when added with water. I have a full review on the Magnitone HERE. In that review it is more in-depth, and I also did a 7 day trial which I documented on how it improved my skin in that time. Magnitone have also just recently released a limited edition precious collection which comes in two new beautiful shades Rose Quartz (pictured) and Glittery Gold (Available Here). Perfect gift ideas for Christmas, and currently on offer! 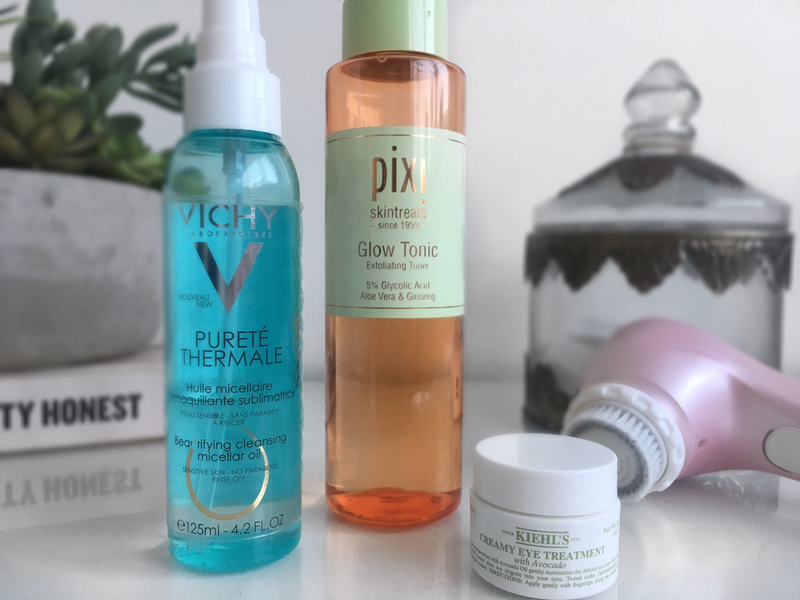 After cleansing I like to use the Pixi Glow Tonic, This smooth's, refreshes and really brightens up my skin, this was in my October Favourites post and yet another product I will never be without now. Next I use the good ol' trusty Hydraluron by Indeed Labs. I have been using this for a good year or so now, and recently found this huge sized 50ml one in Tk Maxx for only £7 which was a complete bargain! (30ml RRP - £24.99) so keep your eye out next time you are there guys! I love how my skin instantly absorbs this serum, it hydrates it putting all the moisture back in and keeps it there which is what you need after using AHA'S any other exfoliates which can dry out your skin a little. I use that along with the Roger & Gallet Double Extract Serum which I have been loving at the moment (full review here). Eye Cream wise (day and night) I have been enjoying the Kiehls Creamy Avocado Eye Treatment, It's quite thick for a day time one I know' but I get really dry eyes, especially on the outer corners when my eyes water in the day, so this really moisturises and soothes. 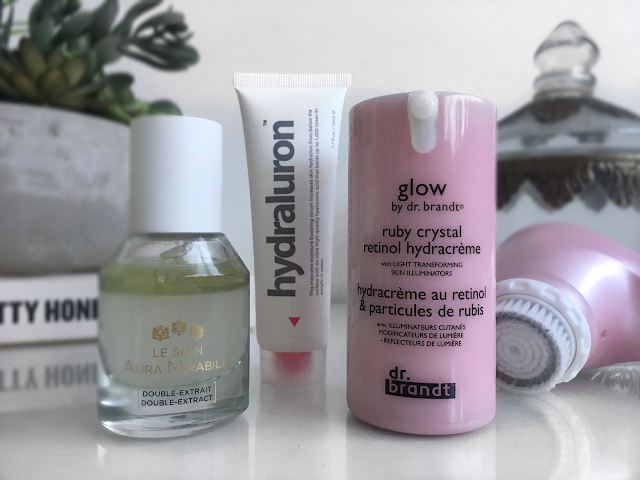 Then I have been using the Glow Ruby Crystal Retinol Hydracreme by Dr. Brandt. This was another Tk Maxx Bargain, This moisturiser is normally around £40 I picked this up for £16 and it's brilliant. Since I have been using this I have noticed how much more healthier, and glowy my skin looks. It really smooth's out any fine lines, and has helped with discolouration on certain parts of my face. Plus the bottle is really cute ha! You can find some right gems in Tk Maxx sometimes it's worth a look. I'm no skincare expert, but I have genuinely been enjoying my results since using all of these products. Have you tried any of these? what are your favourite skincare items/tools? I would love to hear your thoughts.